Author Eliza Nolan: The Best of YA Dark Fantasy Giveaway! 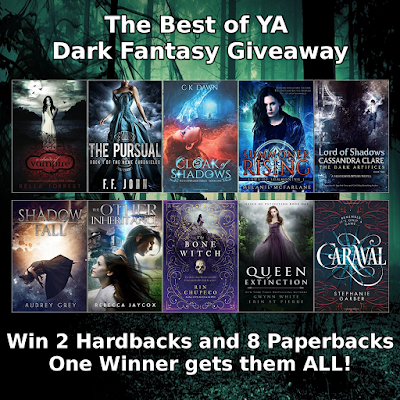 The Best of YA Dark Fantasy Giveaway! Paperbacks: Lord of Shadows (Donated by Author Megan Crewe), The Pursual by F.F. John, Summoner Rising by Melanie McFarlane, The Other Inheritance by Rebecca Jaycox, Cloak of Shadows by C.K. Dawn, Shadow Fall by Audrey Grey, A Shade of Vampire (Donated by Author Marta Kaitidis), and Queen of Extinction by Gwynn White).